Time to start working on your Tagalog? Canadians are understandably proud of the diversity of our country — the people who have chosen this land, through the generations, to call their home, and continued to honour their traditions throughout their lives here. And nowhere is that more apparent than in the languages we speak. Take a ride on transit or a walk through a park in any of Canada's major cities, and you might only hear a smattering of English or French, mixed in with a variety of other languages and dialects from around the world. The recent information from Statistics Canada about Canadians' mother tongues showed that the percentage of the population that speaks English is currently almost 60 per cent, while the percentage that speaks French is 21 per cent. Aboriginal languages made up 0.6 per cent. That means there are plenty of people in Canada who don't speak in any of the official languages at all, which corresponds to the 2011 Census finding of one in five Canadians not speaking English at home. 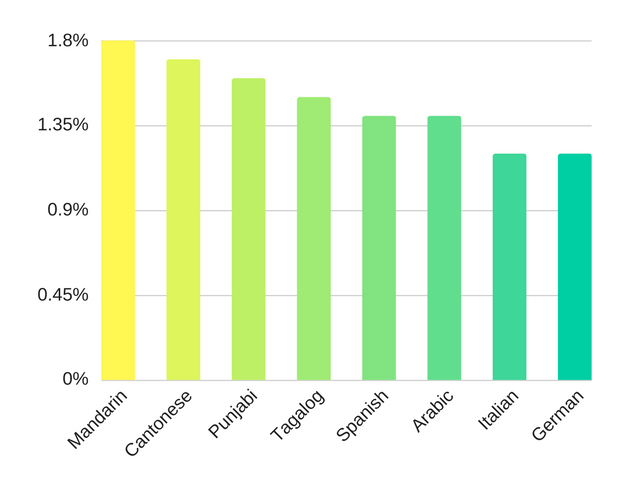 These languages make some sense when you look at the ethnic makeup of the population, which in 2006 saw more than three million Canadians identifying as at least partially German, 2.2 million Canadians in the East and Southeast Asia category, and 1.35 million people with a Chinese background. That said, there were plenty of people who reported more than one language as their mother tongue. It seems the languages spoken by Canadians not only reveal countries of origin, but also the cultures that have been kept alive and well through generations. In total, 196 specific languages were reported as being spoken in Canada. In total, 196 specific languages were reported as being spoken in Canada — 66 Aboriginal and 128 "immigrant" ones. The areas with the most diverse populations in terms of language were, unsurprisingly, the largest cities like Toronto and Vancouver (which reported 46.5 and 44.7 percent of the population speaking an immigrant language, respectively), but areas with fewer inhabitants showed a fair amount of heterogeneity as well. Whitehorse, for example, had 11.6 per cent of the population speaking another language (the most popular being Tagalog), while Prince Rupert, B.C., had 12.6 per cent of its citizens communicating in a language other than English or French — most notably, in Vietnamese. In the Kitchener-Cambridge-Waterloo region, almost a quarter of the people spoke in an immigrant language; 2.4 per cent of people spoke German. The detailed information from Statistics Canada gives a fascinating look at the current makeup of Canada and where various cultures have settled around the country. But it's also an important lesson in where we're heading in the future — and why learning a language outside of English and French could be to a huge advantage.